A grumpy Korean war veteran Walt Kowalski (Clint Eastwood) just lost his wife. While still mourning for his wife's death his two sons who were like strangers to him wanted him to move to a nursing home and later on kept on asking about who he would want to leave his properties when he dies especially the '72 Gran Torino . This made him more irritated of them. His neighborhood is resided by a lot of Asian people and Walt despises them especially the Hmong family living next door. He despises everything around him: the dirty lawns, the culture of the Asians and the gangs that seems to be around all the time. Be it Asians, Mexicans and black American gangs who act like they own the neighborhood. That is why he keeps his M-1 rifle cleaned and ready at all times. The family next door consist of the teenage son - Thao (Bee Vhang), the man in the house yet the underdog, his sister Sue (Ahney Her) who always does the talking, his mom and eccentric grandma who don't speak english at all. Being an underdog, Thao does most of the house chores and was always picked by the gangs on the street. He was later on persuaded by his cousin Spider (Doua Moua) to join their gang so that noone could harm him since they're gonna be there to back him up. His intitiation was to steal Walt's 1972 Gran Torino. The night of the intitiation was interrupted since Thao was caught by Walt before he can even start the dirty deed. He ran for his life after seeing the gun pointed at his face. The gang went back to Thao after a few days and forcefully dragged him from their porch to assault him. Thao's and his family's pleadings are to no avail until Walt came out of his house with his gun pointed to the perpetrators and ordered them to get out of his lawn. They fled out and left a threat for Walt to watch his back. After that incident, the Hmong family was grateful for his help and gave him a lot of food as a sign of their grattitude. They kept on thanking him but Walt just told them that he just wanted the gang out of his lawn. This didn't stop the Hmong family from giving him food and when the neighborhood heard about this, more dishes and flowers were displayed on his porch. This agitated the old man and as grumpy as he is, he threw most of the presents to the garbage bin except the food. While Walt was on his way home one day, he saw Sue about to get harassed by three black men. He saved Sue from the thugs and threatened them with his pistol. Later on Sue got fond of the old man and she introduced him to the Hmong family. Eventhough Walt is grouchy and irritable with everything, Sue seem to get used of this even the cussing of the old man. They became friends and Thao was later on volunteered by his family to work for Walt since he admitted that he tried to steal Walt's car. The old man doesn't like the idea at first and tried to decline the offer. But when he learned that it is part of their culture and that he's going to offend them if he says no, he was left with no choice. He eventually made Thao clean up the neighborhood. Eventually Walt learned to like Thao. He basically taught the boy to become a real man. He even got him a construction job and a girlfriend named Youa whom Walt refer to as "Yum-yum". I like the part when he was insulting Thao for not asking "Yum-yum" out when he got the chance. There was this young priest whom Walt doesn't like as well- Father Janovich (Christopher Carley). He shows up at Walt's house and tries to convince him to go the confession since this was Walt's wife's request before she died. Walt refuses to do so. Walt get's more concerned of his friend Thao when he learned that the gang still kept on pestering the boy. They even burned his face with a cigarette and destroyed all the construction equipments that Walt bought for him. After learning this, Walt beat one of the member of the gang and told him to stay away from Thao. But this just started the angst of the gang. The following day they shoot Thao's home and wounded him on the neck. Walt who was watching TV at home at that time hurriedly went to his neighbor to check on his friends. While attending to Thao's bleeding neck and made sure that the mom and Grandma were okay, Sue came home that night, beaten and raped. Walt ran back to his house punching the walls with his bare hands. Thao was so angry that he wanted to take revenge for what had happened to his sister. He was even more pissed when he saw Walt staying relaxed the next morning. He just wanted to go and kill the gang but Walt hushed him and told him to relax for a little bit and go back in the afternoon. At that same day Walt went out to do his monthly haircut and bought himself a suit. He even went to confession that day and left Father Janovich guessing about what he's about to do. The priest was suspecting that it's going to shed blood that day. Thao went back in the afternoon ready to hear the plan made by Walt. But then Walt locked him in the basement after he's given a gold star. Walt went to the house where the gang resides. Knowing that the gang won't stop from harassing the Thao's family, he decided to end it right then there. After a few words for the gang, he attempted to light his last cigarette. The gang thought that he was pulling a gun out of his jacket's side pocket, they fired gun shots at him. He was killed right in front of the porch with all the neighborhood watching! The gang were arrested for that, of course. Thao and Sue arrived on the crime scene and watched the bad guys being handcuffed and they were later on informed by the police that these men are going to stay in jail for the rest of their lives. A lot of people went to the funeral and mourned for Walt's death including his two son's and their families. 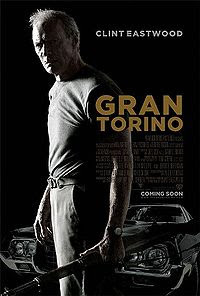 In his will, he donated his house to the church and his Gran Torino to Thao which angered his family. Walt basically ended his life to give Thao and his family a peaceful life. Although the movie was tragic, it still made me smile. Clint Eastwood did a great job starring as Walt and also as the director and producer of the movie. I give him an A! Lol! hey, nice site! i'm kinda a newbie in this blogging stuff so i'll apprecaite it if you'll drop by my site and/or leave a comment. i can also have you r blog URL linked so to increase your blog traffic. I have to see this movie. Could be Clint's last role in fron of camera.